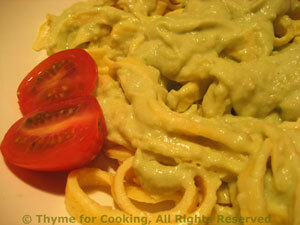 Egg Linguini, Warm Avocado Sauce, Thyme for Cooking gourmet starters. A spring update on the 'Egg Noodles with Prosciutto', these noodles are dressed with a light, warm avocado sauce. Garnish with a few cherry tomatoes to add color. Cut avocado and remove pit (see techniques). Scoop it out of the shell and put it into a blender. Add chicken stock, lemon juice and purée until smooth. Pour it into a small saucepan and gently heat until just warm. Stir in yogurt, keep barely warm until needed. Put eggs in medium bowl and whisk well. Add flour, a little at a time, sprinkling it across the eggs, and whisking well after each addition. Try to avoid lumps. Add the milk and whisk well. Heat the oil in a medium nonstick skillet or omelet pan, 7 - 8" (20cm) in diameter, over medium heat. Add 1/3rd of the egg mixture, tilting pan to cover well. Let cook, undisturbed for 1 - 2 minutes, until cooked through and top is dry. With a spatula, carefully turn and cook on the other side for 30 seconds. Remove to a plate. Do not keep warm. When eggs are done, and cooled slightly, roll each up like a cigar and slice 1/4" (.6cm) strips. Divide strips in half. Arrange on plates, spoon sauce over, garnish and serve.